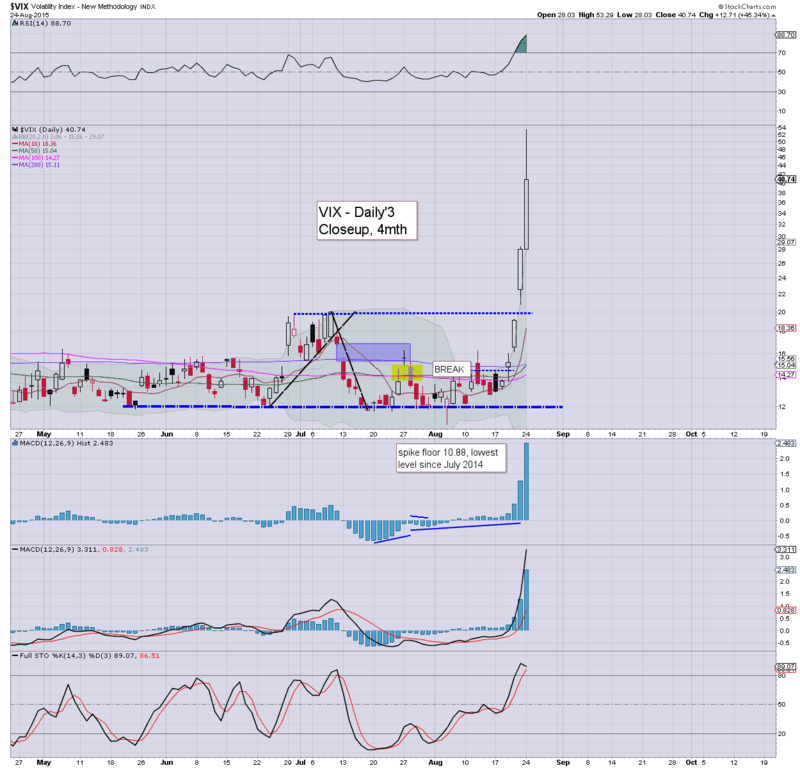 With US equities in crash mode, the VIX screamed into the 50s, settling +45.3% @ 40.74 (intra high 53.29). 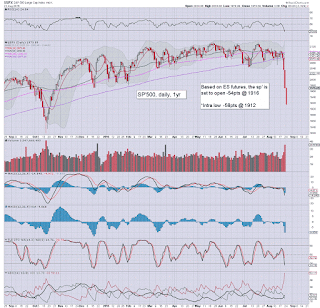 Near term outlook threatens continued downside to the low sp'1800s.. which would likely equate to VIX back in the 50s. Worse case for the equity bull maniacs.. sp'1700s.. with VIX 60/70s. 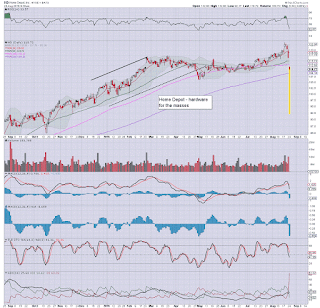 I very rarely highlight the giant monthly chart, but it really does put things into perspective. After almost four years of a subdued VIX, finally, volatility is back. This morning's intra high in the 53s is the highest VIX since Jan'2009. Outlook/best guess. 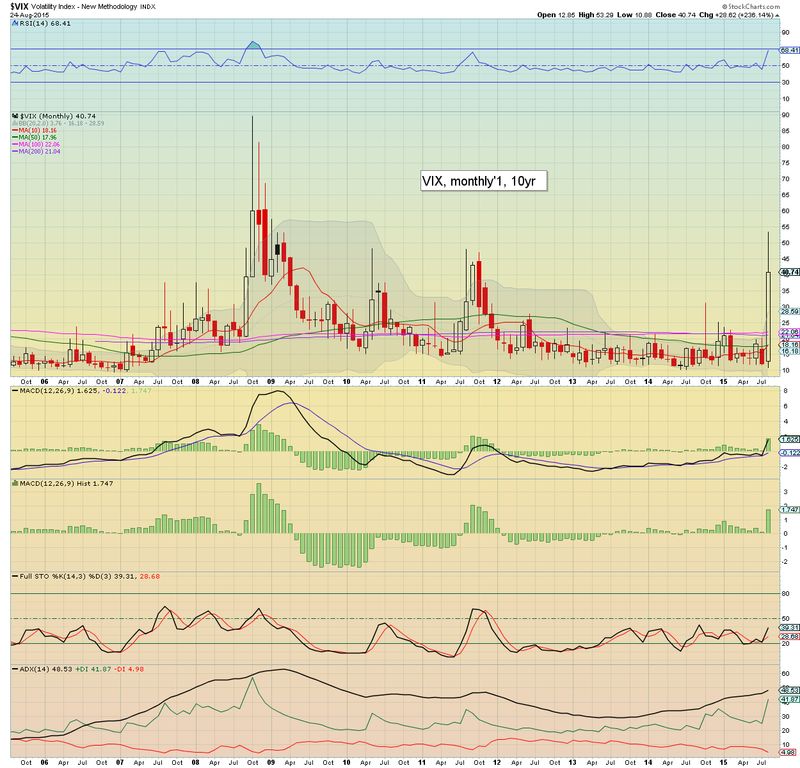 Lower equity levels look due, and that should equate to VIX back in the 50s. However, 'best bear case' is the sp'1725/00 zone.. and that would likely equate to VIX 60/70s. *That would make for one hell of a short-VIX entry... in instruments such as XIV. ... and a truly wild and crazy day comes to close. Frankly, if you didn't get zeroed out today, and didn't completely lose your mind, then congrats... you're in the 'successful' group today. *yours truly is on the sidelines. with an intact trading account. 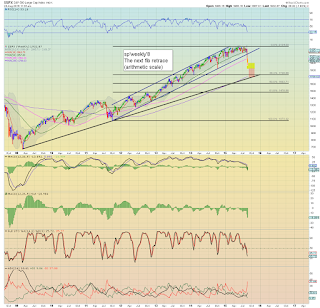 I would consider going long around sp'1820.... or short from 2000/2050. US equities are set for increasing severe weakness into the close, as unquestionably, some of the trading rats will have to be liquidated into the daily close. Right now, a daily close <sp'1900.. along with VIX 40s looks... highly probable. Some vicious closing hour selling looks due.... strap in. 3.10pm... Santelli on CNBC bitching about the Fed... as ever. One of the constants of the universe. sp -71.. @ 1899... a sub' 1900 on track. 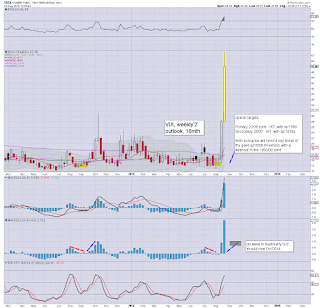 VIX 40s. 3.43am.. wild west trading.. Dow swings from -700 to 464 in barely a minute or so.... INSANE. 3.49pm... well, its been one insane crazy day. Tomorrow is likely to see further insane swings.... the issue is whether we break a new low... or bounce back to the 2000/2050 zone. With the sp -61pts ... 1909. .... back at the close. US equities have seen yet another powerful swing, this one from sp'1954 to 1929. 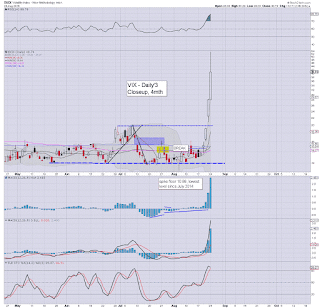 VIX is similarly back on the climb, +20% in the 33s. Some late day 'margin calls' seem a given... with a sub 1900 close back on the menu. USD remains under severe pressure, -1.5% in the DXY 93.50s. So... we have a micro flat top in the sp'1950s.. and we're clearly back on the slide. *I remain paralysed with fear. It is not confusion of where we are broadly headed (which has been largely clear since mid May).. but fear of losing a single $. Frankly, its beyond lame, and I'm starting to get real annoyed with myself. I suppose it could be worse. 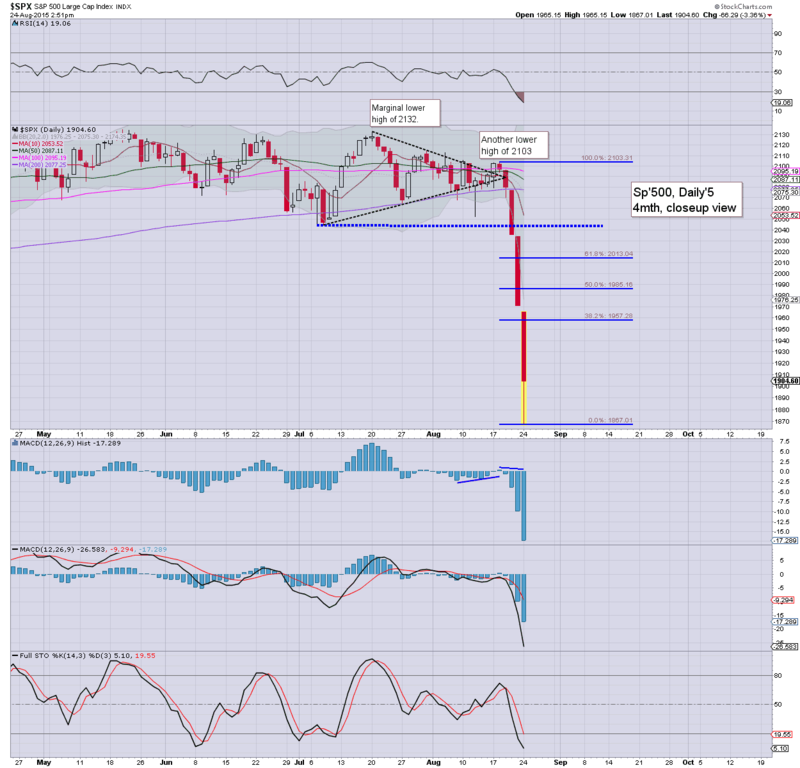 I could have been long across the weekend, exited at the open, and then tried to chase the market lower from sp'1869. US equities continue to rebound, and most indexes are now within range of turning positive by the close. VIX has rapidly cooled from the 53s to 30. As things are, a multi-day bounce looks very possible, but those holding long overnight will be at serious risk. *with the current price action so strong... the threat of another major wave lower is diminishing.. as reflected in the VIX which is set to lose the 30s. For now.. I am content on the sidelines.... as others are doubtless willing to battle it out in what remain hazardous conditions. Call it what you want, but unlike some, I ain't lost anything today. re: AAPL. There is of course the issue with Mr Cook and his love letter to Cramer. Ohh, I mean... the 'this is not breaking any SEC rules' letter. Yes.. everything is fine when you're a billionaire.. if your stock is under pressure.. just give Cramer a call... or fire him an email telling him how your sales are fine. No doubt, despite some - notably those on ZH, calling him out on it... Cook is one of the gang... he won't get pulled up on this mornings letter to rescue his stock. 1.24pm... Well... the micro 15min cycle looks maxed out. Now its a case of how far down we go.. but I've seen too much upside to consider shorting into this. .. or maybe I'm just weak? US equities remain seeing some extraordinary nano/micro swings, as the battle continues. Some traders/commentators are calling sp'1867 a key low - along with VIX 53s. However, the bigger weekly cycles continue to offer a full test of the Oct'2014 low of sp'1820... and even the 1725/00 zone.. within days. 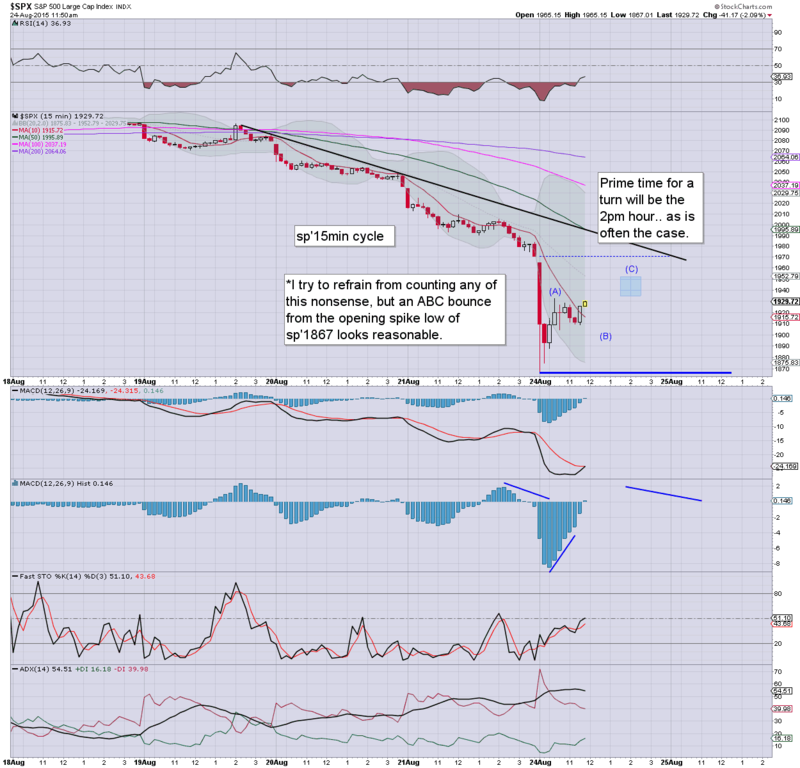 Suffice to say... lets see where we are trading in the 2pm hour... I suspect we'll max out there.. and fall into the close. 12.27pm. 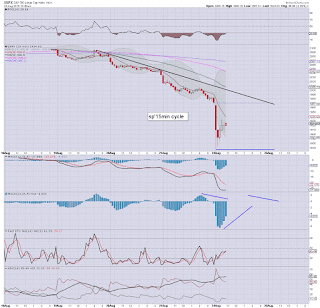 The bounce is getting a little strong, and as things are.. any index-short looks overly risky. After all, there is obvious upside to 2040/50.. or even 2070s.. before resuming lower. US equities have seen a powerful hyper-ramp from sp'1869 to 1932, with VIX cooling from 53.29 to the 37s. This is an incredibly unstable market, and all things considered, sp'1869 makes little sense as a key low. 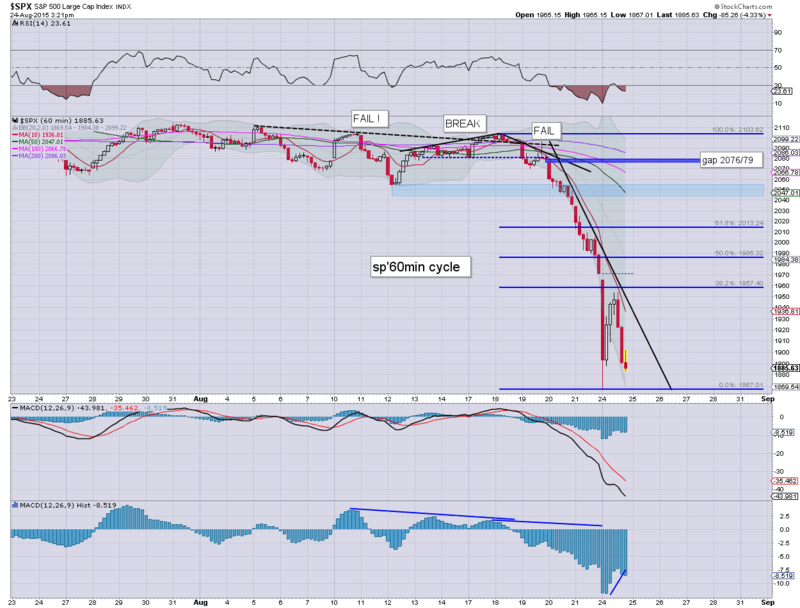 The broader weekly cycle is offering 1820.. and then 1725/00 in the immediate term. 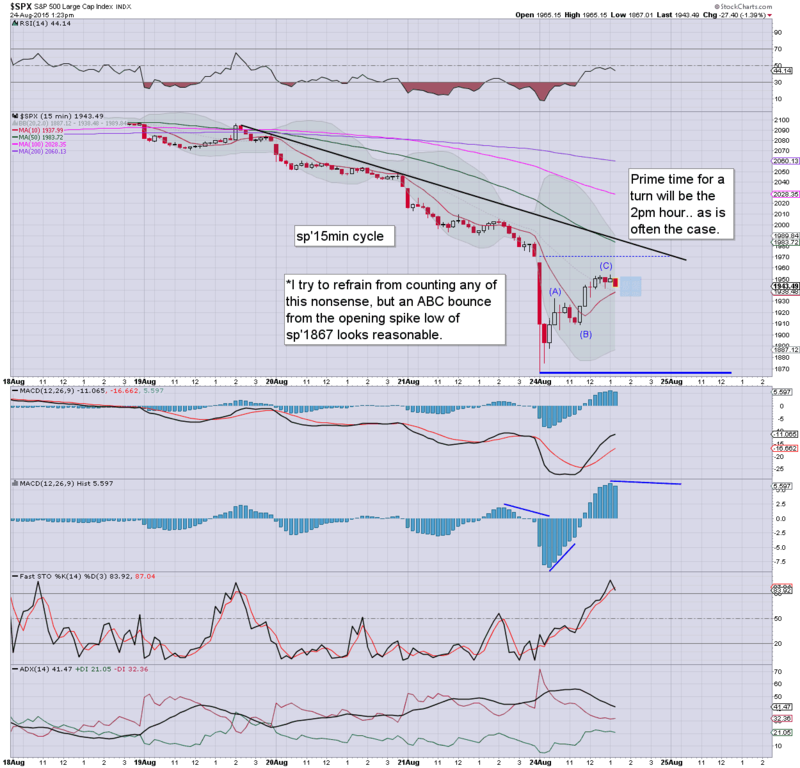 I could highlight a thousand charts.. but for now the above two will have to suffice. We're clearly seeing some crazy swings.. and those will likely continue for some days. 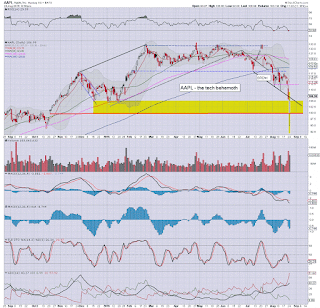 You can see this is week 2' down since the break of core support - from Oct'2011. A basic fib retrace is HIGHLY suggestive of the low 1700s before a key low might be in. I realise 1700s sound crazy.. but then.. so did sub' 2000 a few days ago. 11.17am.... sp -57pts @ 1913... a daily close <1900 looks highly probable. The only issue in my view is whether we see the circuit breakers today (sp'1832). Its just an idea. I will consider a short-index position this afternoon, it really does depend on price action across the next 3-4 hrs. 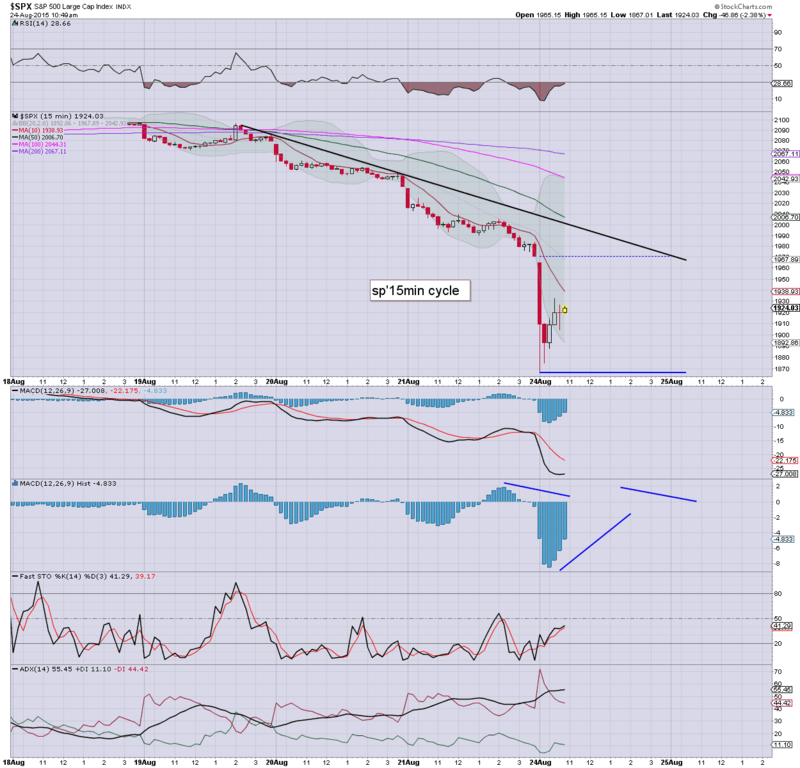 US equities are seeing extremely dynamic price action.. with the sp' seeing an early low of 1867. Wild swings are likely to continue across today.. and the week. The market is utterly broken.. so much so.. there isn't even a quote so far today for the VIX. 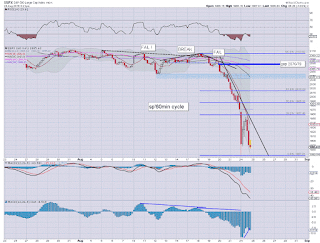 Those downside prints are viable targets for end today.. or later this week. *special note.. market looks set to be halted at some point today... with sp'1832. 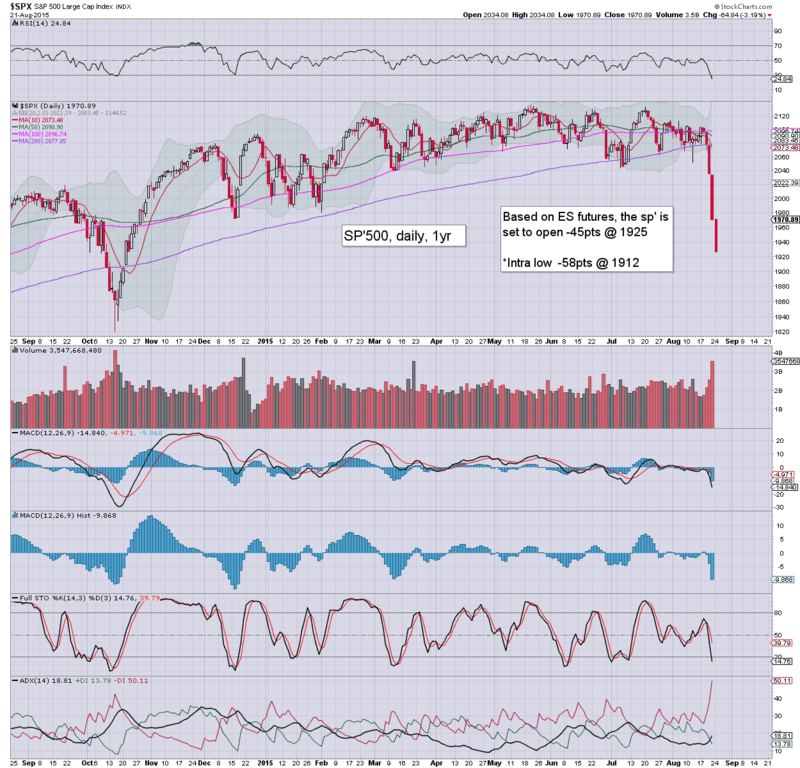 The Oct' lows are easily within range... after that... 1725/00. *in the low 1700s.. I would be 100% long. For now... I watch. 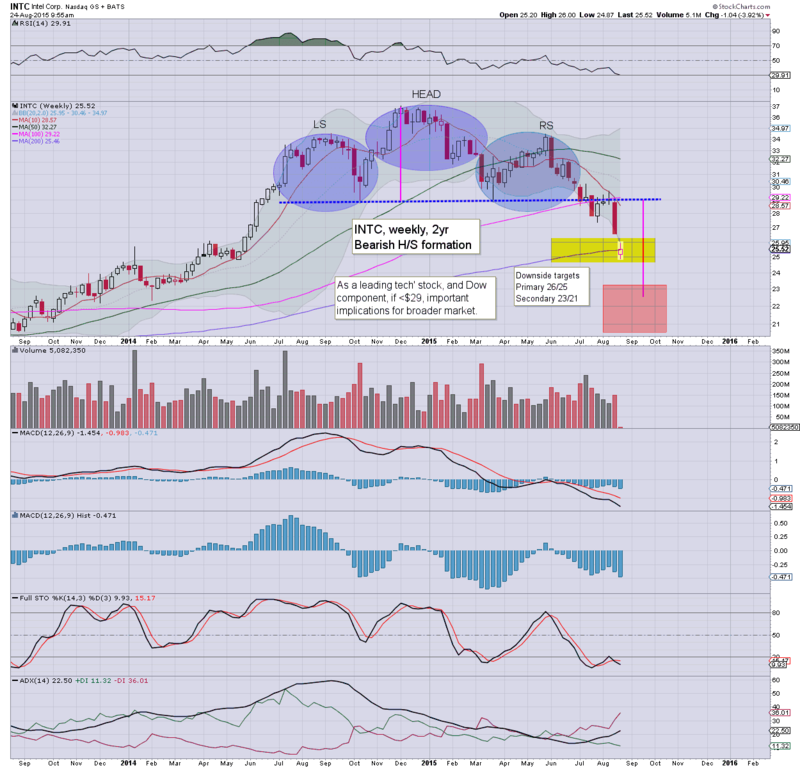 A stock I have been highlighting since May... INTC.. which has played out very well. First target zone hit... H/S scenario offers 22s.. within the immediate term. TRADING note.. option spreads were insane at the open... 20% wide... now down to 8% on more liquid stocks. 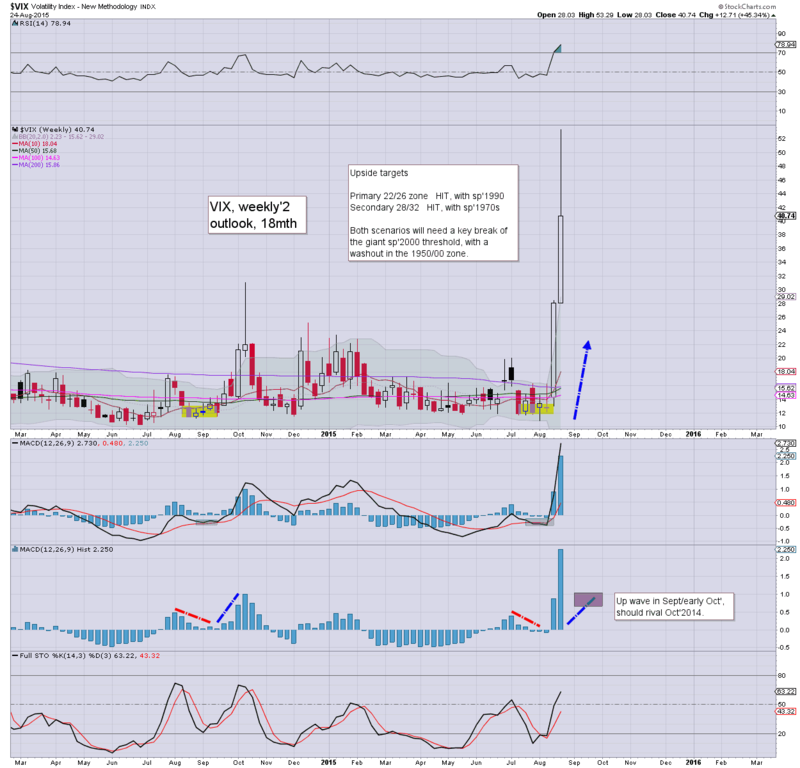 10.04am.. We have a VIX PRINT !! A short this afternoon at 2pm? Hmmmm. 10.20am.. not surprisingly.. some are coming out calling a floor. 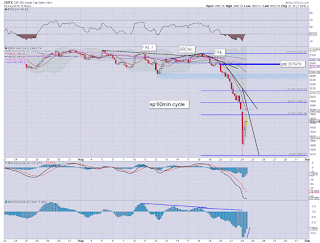 As things are.... sp'1867 makes little sense as a floor. 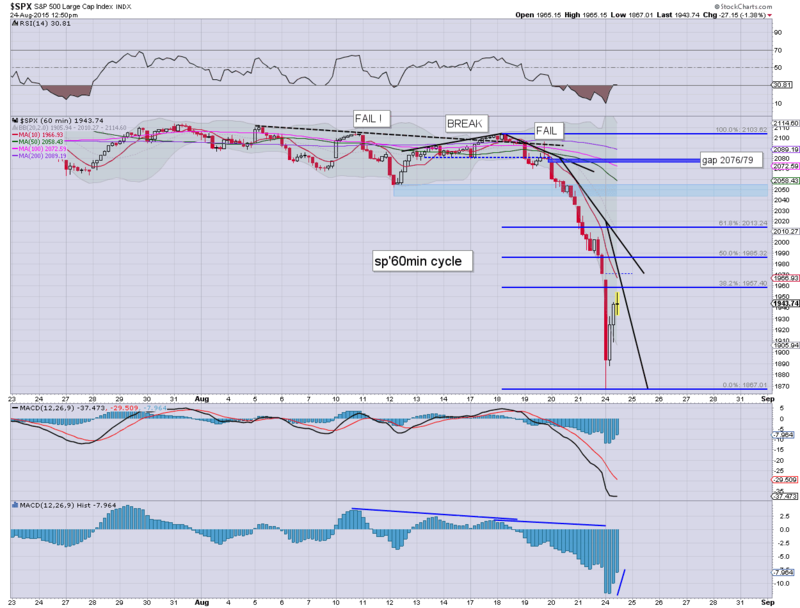 10.37am.. the wild swings continue... back to sp -52pts @ 1918. 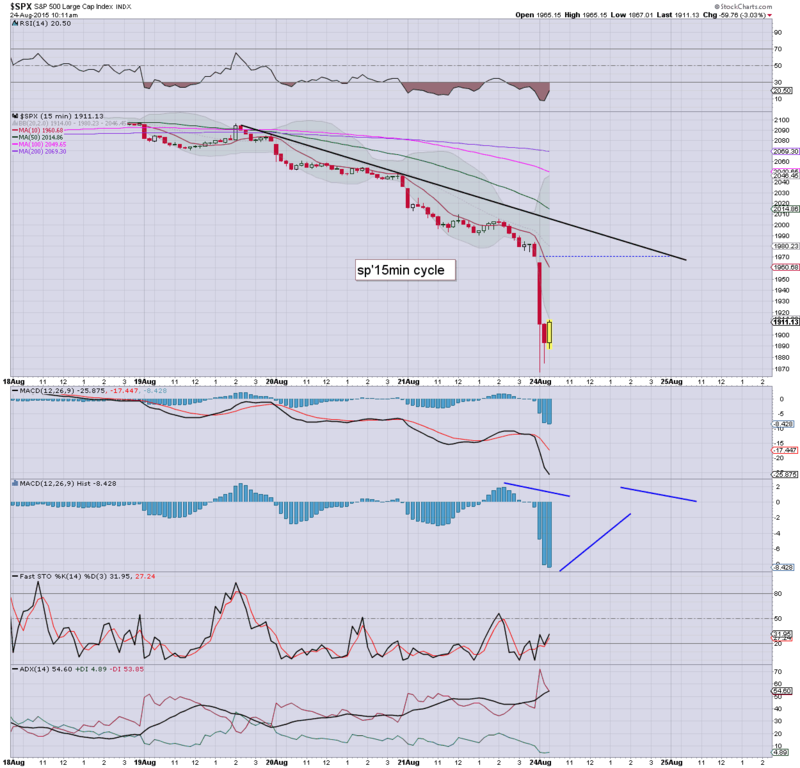 Traders are going to need to get used to seeing the sp' regularly flip 20/30pts... this could last for some days. ... it is days like this.. why I remain here posting. I hope all of you are 'careful' out there.... some will no doubt get zeroed out today. There can be no excuses for at least some degree of risk management. Best guess... broad downside across much of the day. 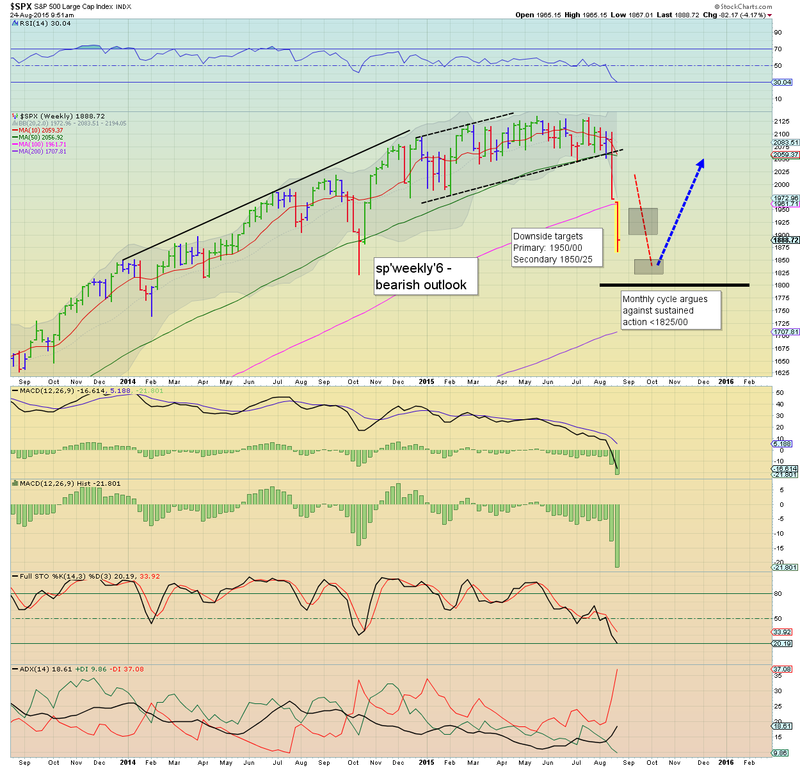 A daily close in the low 1800s remains VERY viable.. along with VIX 50s. 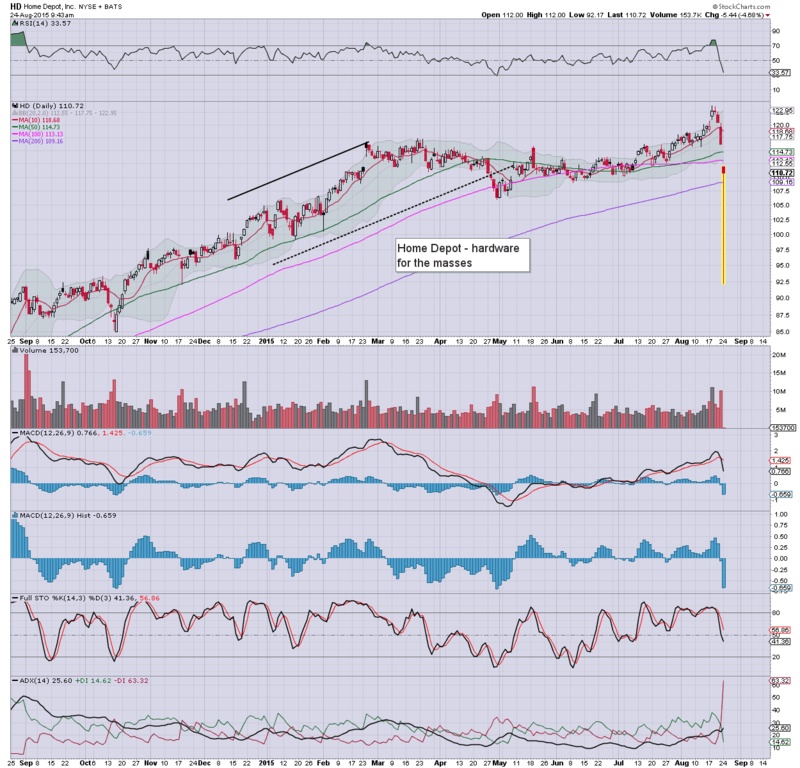 No doubt an equally insane bounce is due... but for now.... this train wreck might only be half way complete (low 1700s). I have to note, I do find it especially pleasing to see the utter horror and bemusement at all those on CNBC/Bloomberg - who have been cheerleading this market higher this year. They have increasingly been unable to cope with ANY kind of down wave this year... and with core monthly support broken... they are indeed starting to panic. 9.17am.. sp -101pts... 1869... a mere 37pts from a halt. 9.35am.. so far... NO VIX opening quote. 9.42am.. Option spreads have EXPLODED wide.... 20% typically.... effectively... untradeable. Good morning. US equity indexes are effectively in crash mode, sp -45pts, we're set to open around 1925. 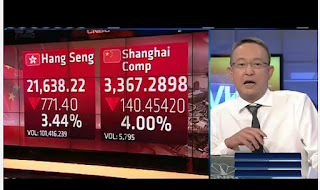 Japan and China settled lower by -4.6% and -8.5% respectively. 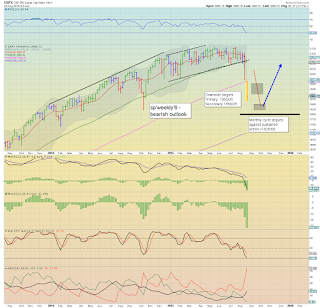 Today offers a real threat of a close in the low sp'1800s... back to the level from Oct' 2014. 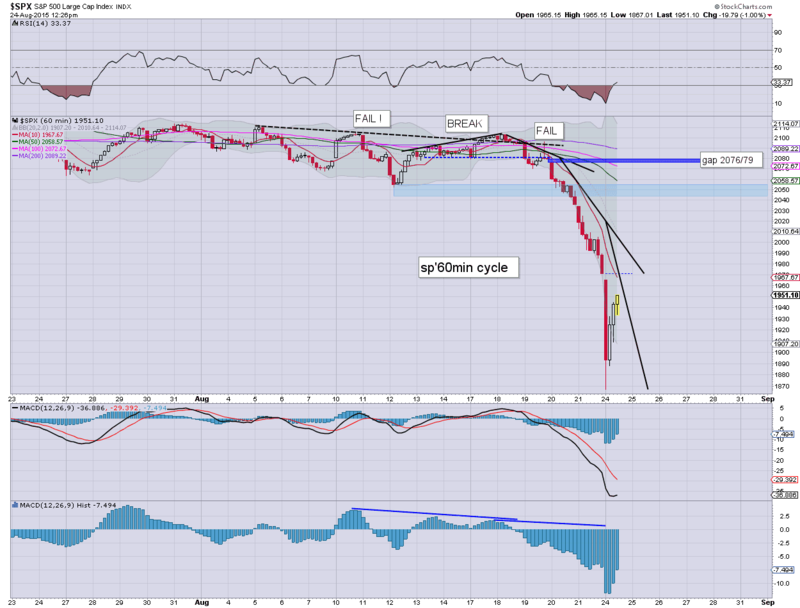 It has been a long time coming since the market floored in Oct' 2011 @ sp'1074. 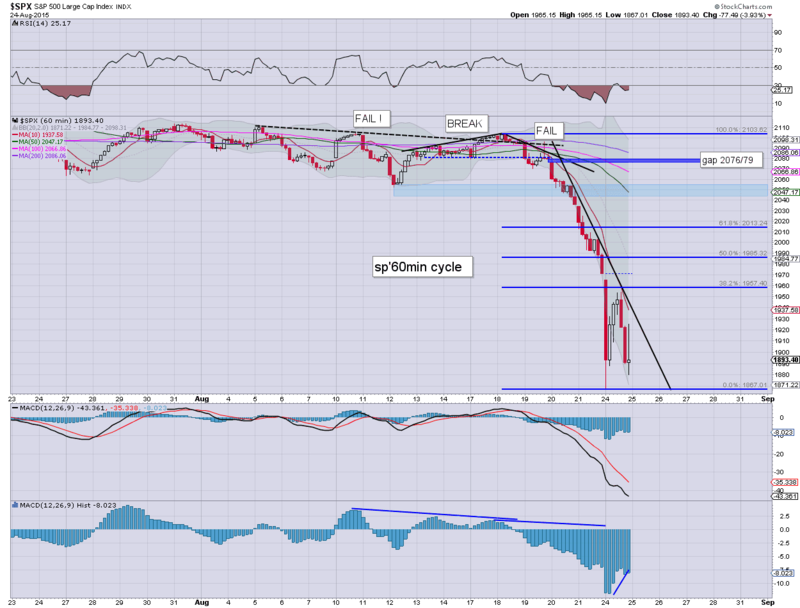 With the giant monthly cycles BROKEN... there is monstrous potential for downside in the days and weeks ahead. Interesting to see his take on things... but already his first ES target (1916) has been exceeded in overnight trading (intra low 1911). 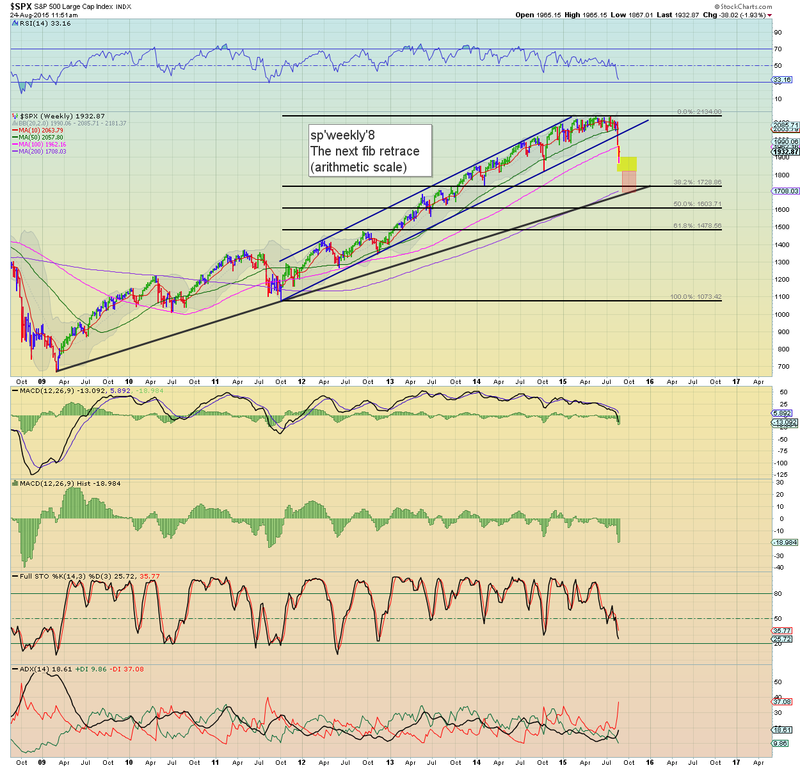 I would be surprised if the market finds support in the 1880/60 zone. Doomer chat, Hunter with Celente. Celente used to do the mainstream media rounds up to 2008... but then he got banned... as they could not cope with a lot of his political views. As ever.. make of that... what you will. We have a VERY serious potential for a major collapse today, at least in the realm of 5-8%. 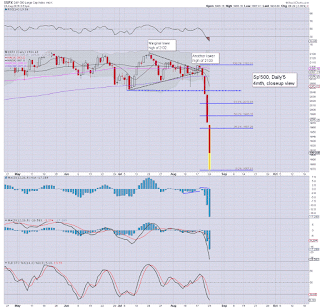 First core target is the Oct' low of sp'1820. Secondary target is rising support, with 38% fib retrace of the 2011 wave @ 1725/1700. *Keep in mind, circuit breakers don't kick in until an initial fall of -7%. So.. its entirely possible we test the Oct'2014 low on many indexes, without the market being halted. Priority one.... don't lose money. I've little interest in chasing the market lower. Instead, I plan to sit back and watch the entertainment... and eventually look to pick up a bargain... but not today... and preferably... not until sp'1850/25 zone. Have an entertaining day everyone.... and be careful out there! 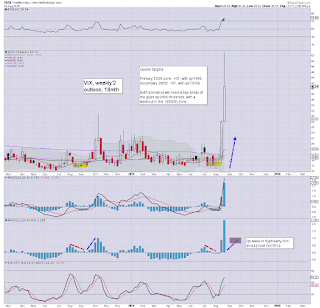 TVIX/UVXY, set to open +23% or so. With VIX closing at 28s.... we'll surely open somewhat close to 40. If market unravels to the low 1800s... whether today.. or later this week.. the giant 50 threshold will be danger of bring broken. 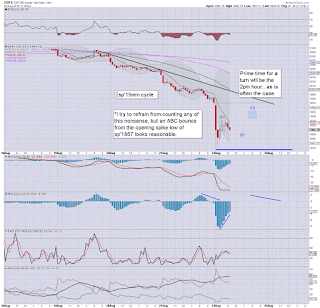 *for the traders out there... short-VIX would be a tempting trade..but to me... it is extremely risky.. and no doubt. some retail amateurs who are short-VIX across the weekend are going to see their accounts zeroed out. 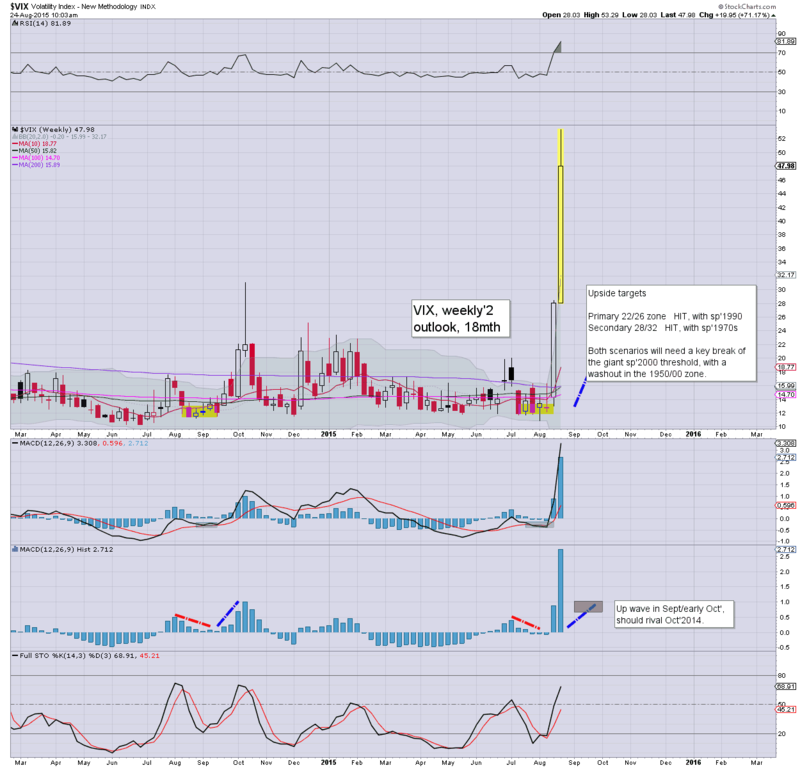 TVIX/UVXY +29%... with VXX +15%... it does bode for VIX 40s at the open. 7.40am.. sp -56pts.... 1914.... VIX is effectively going nuclear in pre-market... probably equiv' to 45 or so right now. 7.45am... NEW lows... sp -65pts... 1905.
a micro bounce.. . sp -63pts.. 1907. 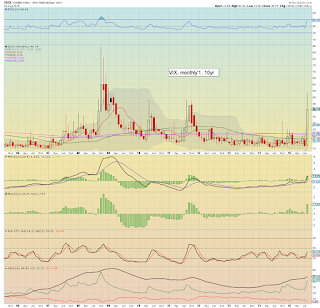 Regardless.. we've already broken into the 1800s.. with VIX surely in the 40s. 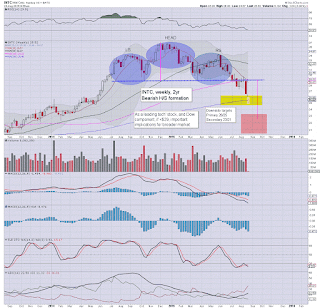 notable movers... AAPL -6% in the 98s, DIS -5% in the 94s, INTC -4% in the 25s (H/S target remains 22s). Okay.. so, we're seeing some very severe overnight declines... and when we wake up.. we could be seeing early trading in the sp'1800s. 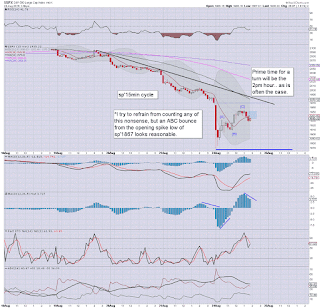 re: VIX. With another 50pt drop.. VIX will probably open in the 38/42 zone. If market sees a worse case drop of 7% to sp'1820... then VIX will be above the giant 50 threshold... something not seen since spring 2009. Tom Keene will be on Bloomberg at 6am.... and I'd like to catch his first reaction to the Friday drop... and Sunday night carnage. ... and really... that should be it for me this night. 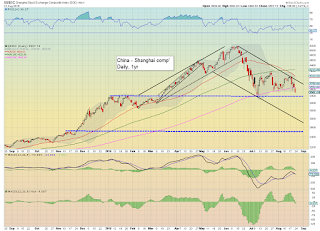 Whilst US equities futures are sp -18pts @ 1952, there is more exciting downside action in China. 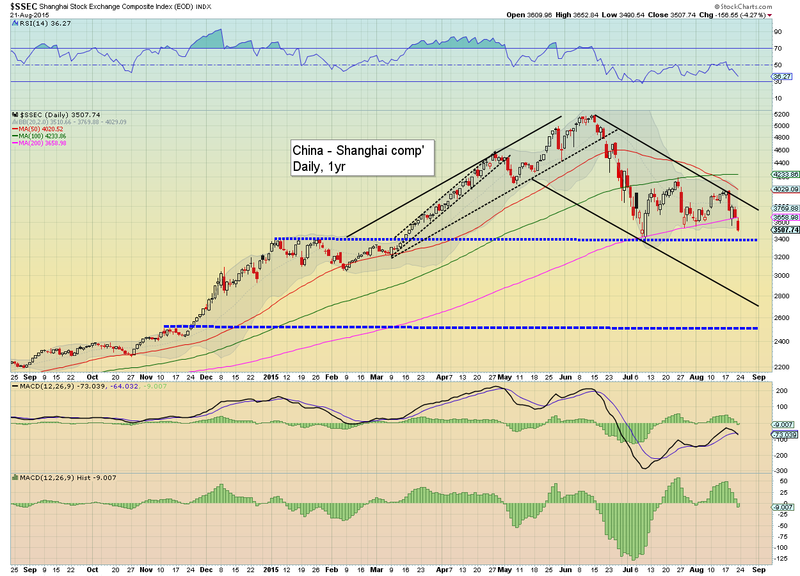 The Shanghai comp' has decisively failed to hold the summer low of 3373. 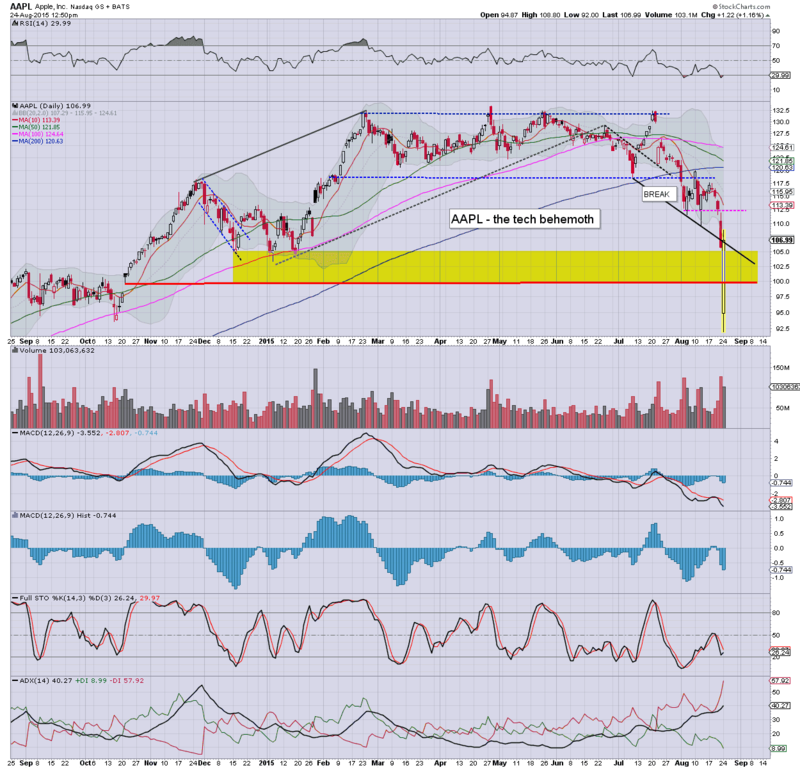 Next support is 3200/3000.... worse case... 2500. The communist leadership will not be pleased. A clear break of the low... and broad downside looks due for at least another 4-6 weeks. It will be interesting to see what crazy new measures the Chinese leadership come up with in the next few days. Will they even resort to shooting Panda bears? After all... maybe they are part of the 'malicious short sellers' group? 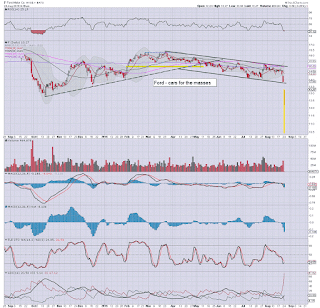 US equities remain moderately weak, sp -11pts, equating to an open of 1959. Meanwhile, Japan has opened, with the Nikkei lower by around -2%.. at the 19000 threshold. 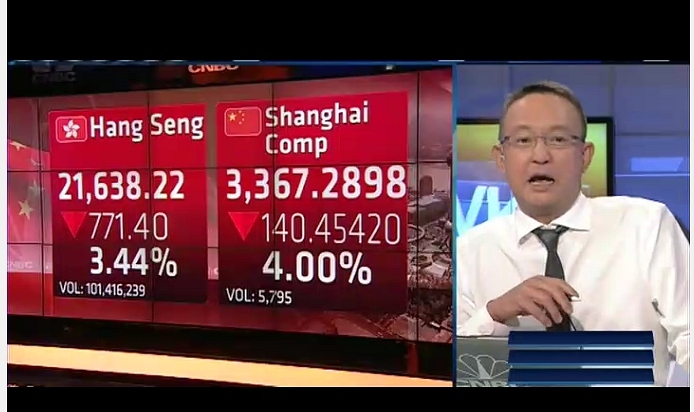 The more interesting market though remains China.... due to spin up at 9.30pm EST. 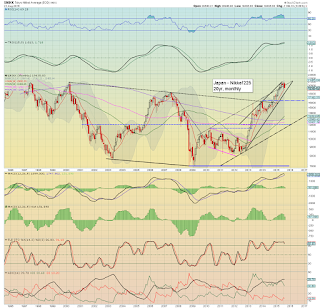 There is viable downside in the Nikkei to the gap zone around 16500. 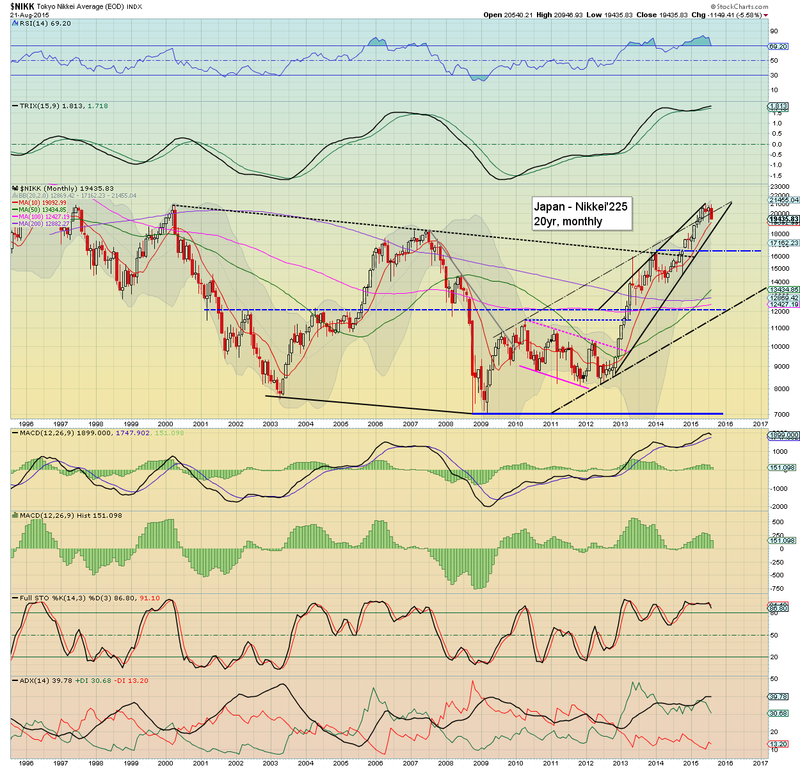 That certainly looks probable by early Oct.
No doubt though, the BoJ will be standing by to rev up the money printers. *Final update of the night.. due at 10pm... after China has opened and traded for 30mins. 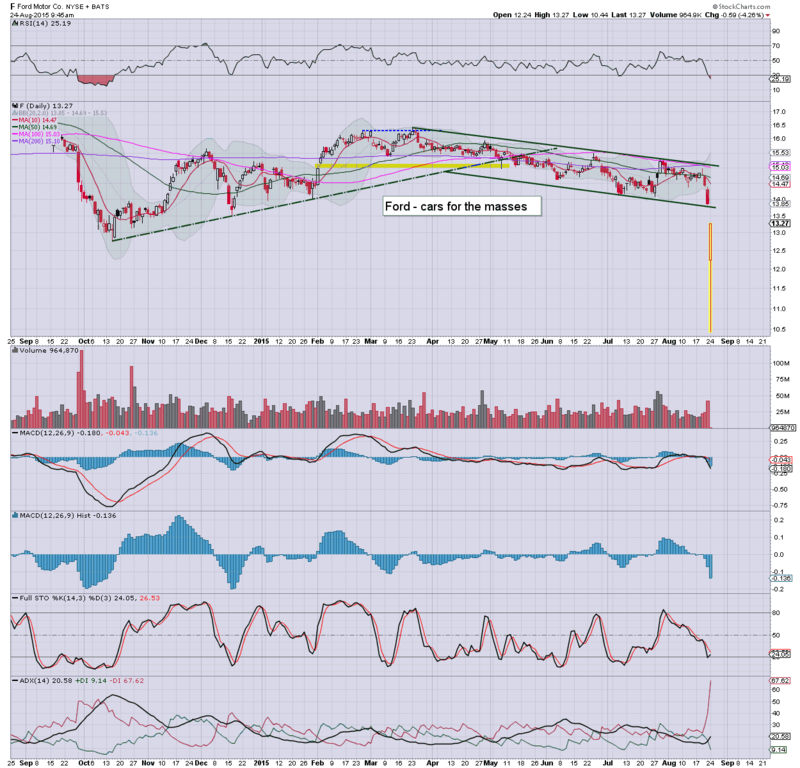 9.39pm US equities starting to unravel with Asia... sp -18pts.. 1952... new lows look due. US equities are seeing a micro bounce from the earlier low of -19pts @ 2051... to -12pts @ 2058. Japan - Nikkei futures are -500pts or so.... but the more interesting market to watch will be China... set to lose the key 3500 threshold. ... its 1am UK time... and I'm starting to fade. ... I'll endeavour to update on Japan and China across the few hours.